There has been a lot of drama going on (at this time) and I just want you to listen. First, what happens here STAYS HERE. If you don’t like a post, DO NOT ADDRESS THIS IN PERSON. Surprisingly, I’m a human. Just a depressed anxious stupid human. Second, I do not mention names, and if you know a post is about you, then that’s your own fault. Starting now, I’m not taking any posts down unless there is a LEGITIMATE reason, (and no, me referring to you as ‘a girl’ and being “revealed” is not a legitimate reason). And finally, if you don’t like this blog why are you reading? There’s a wonderful X in the top right of your browser. Also, this is where I express myself. I hate keeping a diary because I just hate writing because I get hand cramps. I’m horrible at music, and I will probably play high A’s all the time. I don’t like drawing because I’m terrible and never finish. I’m very impulsive when I post, and NO IT IS NOT EASY TO TALK TO AN ADULT. Whenever I talk to my mom she gets mad at me. I don’t want to talk to teachers because like *my parents* I’ll be the lonely solider with a water pistol fighting against all of Russia armed with machine guns. It’s not easy. If you actually read my last post I have a disorder so literally ANSWERING A QUESTION in class takes courage. I always feel judged, so it’s easier to talk on the interne because they won’t see my life and judge me. I can’t talk to childline because my parents tell me off about it. I want somewhere to express myself. YOU CAN ALL HAVE A PLACE, SO WHAT IS WRONG WITH MY WAY? Ok, so it’s literally my birthday in 5 days as I’m writing this (Today is March 30th and also (one of) my best friend’s birthday 😀 ) and I saw P!ATD like 5 days ago and I’m literally sitting in the hoodie that I got from the merch stand and I love sm. I’m also meeting one of my internet best friends on the 9th and I’m excited af for that tooo 😀 Also I’ll probably do another what I got for my birthday because I can. Did you make someone laugh today and was it intentional? 2) What makes you sad? 3) Was today typical? Why/not? I guess, because I do the exact same things on Saturdays. 5) What’s your next major deadline? 6) What did you have for breakfast today? 7) Do you have any regrets today? 8) How did you add art to your life today? 10) When was the last time you danced? 12) What fears did you have today? 13) What did you forget? 14) What is your favourite TV show? 16) Who is the last person you kissed? 17) What did you wear today? 18) What is testing you? 19) What is the oldest thing you’re wearing right now? 21) Where did you spend most time today? 23) Who did you worry about today? 24) Were you creative today? 25) What’s the next major purchase you need to make? 26) What was the last thing that made you cry? 28) Who are you jealous of? 29) Where do you want to go next? 30) What did you read today? Anyway, those are my questions lol. I’m going to go because my laptop is slow as hELL and I’m bored as hell too. I also met theoddonesout, somethingelseyt and tomska on Saturday so I’m probably going to do a vidcon post but I’m not really into blogging atm so I’ll probably do it when I have the energy and time to do it. 2) If you could have a new talent, what would you want? 3) Who is your best friend but not your spouse? 4) What do you wish you had left unsaid? 5) What was the first thing you ate today? 6) Are you saving or spending? 7) On a scale of 1-10, how clean is your house? 8) What is the last song you listened to? 10) What is the most valuable thing you own? 11) What did you find inspiring today? I was binge-watching Eve Bennett’s study with me’s (2017 xmas ones) and they are super motivational so I guess those? 13) How much ‘me’ time did you have today? 15) Who is the last person you said ‘I love you’ to? 16) Did you seize any opportunities? 17) Where did you go today? 18) What advice were you given? 20) What are you glad you did today? 21) When/where was your last vacation? 23) Who is your hero? 25) If you could have read oe person’s mind today, who would you choose? 26) What was the easiest thing about today? 27) Did you thank anybody today? 28) Did you work hard today? 29) What was in your mailbox today? 31) What are you seeking? Did you know I write? Ok so a lot happened during this past month, but I’m pretty impressed with the way I’m handling things. Since I don’t want more people up my back, I’d just spare you the details and say that friendships were lost, bags were bought and advent calendars have (not) been bought. I’m also seeing Billie Eilish next year 😀 (I’m not a huge fan of her but she’s at the Reading Festival 2019 and I’m going anyway to see TOP). I’m not really a big Christmas person, to be honest. I find it very stressful because I’m now in charge of shopping for my friends but all their presents are very expensive (and there are like 7 people to shop for ). In addition, we have family coming over and that’s always very stressful because I get very self-conscious about my MD (even around my parents) and my anxiety, and my house is tiny. So basically I’m either going to have to admit to them that I have this ‘mental condition’ or just hide in my room all day 😀 (I got told off last year for doing that). On top of that ( 🙂 ), I’m not a huge fan of most Christmas food and I don’t want to embarrass myself by having a ‘special meal’ (I’m also VERY self-conscious of my food and eating habits, and hate eating around people I don’t know and will skip meals if it means I have to eat in front/with people I don’t know). I prefer my birthday because it’s always in the Easter holidays (I was born on 4/4) and I pretty much get the whole day to myself where I can do whatever I want. I can go shopping and spend £200 and not feel guilty (I do anyway), I can have fast food all day instead of going to a restaurant, I get presents just for myself. This sounds really self-centred (and it is), but I just think it’s nicer because it’s all my day instead of a ‘family’ day. So idk what this post even is but i think its going to be a mix of me b*tching about my mental illness but also saying how great it is because honestly its probably one of the best things that ever happened to me lol. So i’ve told my parents that i have this (like i literally have every symptom) and they don’t want to believe the fact that it actually has significance, but i’m going to try to explain myself and say that this isnt really normal. Back in March (i didnt even know i had this but this is when it was kind of obvious especially when i travelled because thats when i most commonly daydreamed (either travelling or walking because i didnt use the swing yet)), my dad and I went to Liverpool and he had this whole thing of ‘don’t be plugged in all the time and actually talk to me’. The thing is, i don’t daydream when i’m walking with other people, only if im on a moving vehicle. I know my family and probably people i know don’t like that i act like this/think this is weird but let me just say that my brain literally tells me all the time that i should go and daydream, and this feeling doesn’t stop until I go and daydream. It’s not a matter of ‘if you want to, you can go daydream’; it’s ‘you have to go daydream’. This isn’t easily controllable and it also isnt something that started/will go away overnight. Thanks for reading this post lol i wanted to make this for such a long time because i just wanted to talk about it and i think i have quite a severe case (especially since when I started using the swing back in May) and i wanted to talk about it because i dont think my family and people around me understand this fully and don’t believe me when i say that this isn’t normal. Basically, I don’t really trust group chats (see my march/april 2016 archive about why), and until very recently, I’ve only had them with my closest friends. A few of us are very mentally unstable (me included hehe) but normally we’re very nice to each other. I’ve been wanting to write these ever since exam week (last week) but we had to wait a week for results because we review the papers in lessons. I’m also going to be doing a percentage difference from last year and averages from this and last year. Ok, so most of you probably know that I have generalised anxiety disorder (apparently that’s what it’s called) and I’m in therapy (woo) but I haven’t necessarily been diagnosed with social anxiety. I feel like I do have it though because I have a bunch of symptoms and I have anxiety so maybe I do? Read these mental notes about little things that occur when I go anywhere that involves humans, and decide for yourselves. I really need to get this off my chest, so sorry if this offends you but my mental health has been really bad and I’m literally about to collapse and cry from all the stuff going on, so if this concerns you then please don’t read on please. Ok so in England we have school exams from Yr7-10 to prepare us for GCSE and A level exams. We have 3 exams a day with revision breaks after each exam. Today, we had French Oral, English Language and Physics. French Oral was a 2-hour slot but it takes like 3 minutes per person to do their oral. We did it in register order, and I’m like 5th in the register so mine was done pretty quickly. I didn’t bring revision stuff because a) no and b) I was v lazy the night before with packing. I was reading and talking quietly to some girls in the row next to me. They started writing about revision on a piece of paper and putting like thoughts or something. They were passing it around the class since about 50% of us were done with orals and v bored because the teacher wouldn’t let us talk unless it was testing for orals. Idk what people wrote but I knew it was there because I saw people write it so how could I not. Then, a girl comes back from her orals and hands another girl the note. I heard ‘This is from X’ (not saying name because privacy y’know?) and the teacher started questioning the girl who had been given the note. She finally got the girl to hand it over and told the head of key stage (who is v strict and almost hated in our year). Then the teacher told the deputy head (who actually likes me because I’m smart but can be evil). Lunchtime rolls around. And so does afternoon registration. So, we’re sitting in our places ready for the next exam, when the head of key stage comes in with a note. Everyone squirms because people in my class told me and a few others who weren’t involved to ‘own up as a form’ because it would be easy. [FYI: There are these things called ‘penalty points’ and basically are used in every empty threat, but if you get 3 in a term then that results in a detention and a letter home 😀 ], but then people started talking about penalty points. I don’t know if they were actually issued (we’ll get to why I didn’t know later), but the head of key stage was lecturing us about it, then said ‘at the end of the day, go apologise to [teacher]. It’s the decent thing to do’. I didn’t write/see what was written so I wasn’t going to go apologise. (Which is why I didn’t know because they were probably going to be issued by the teacher mentioned before) Great. All behind us now, right? Wrong. When I got home, I texted my friend who was involved and was like ‘how did the apology go’. Apparently parents are involved so she’s not apologising. She started ranting on our group chat I have with a bunch of best friends (including the one from Matlock bath wink wink) and one of my friends who’s a year ahead was trying to figure out what was going on. She basically told me that I should have owned up and my friend who was involved started giving reasons how everyone was involved. I basically told her that the only reason she was doing that was because she needed validation and wanted to drag me down too. A bunch of my other friends joined the chat and started giving their input, to which my mental health died. So now I’m questioning myself as to whether I should apologise or not. Maybe I just hate people who aren’t my friends (and they only stay for like a night at most) in my house because my house is kinda like my release where I can just breathe and not have a fake persona and bubbling anger. Reading that back I sound like a bratty moron. Gtg die in a hole of mental death. AND I WAS FUMING because that’s not the philosophy of the books at all. I’m in the process of writing an in-depth comparison (it probs wont be out for a few months bc it’s v long), and that quote is just DRIPPING with falseness. “Harry Potter is about how only inexplicable bravery will give you credit and a meaningful place in history. 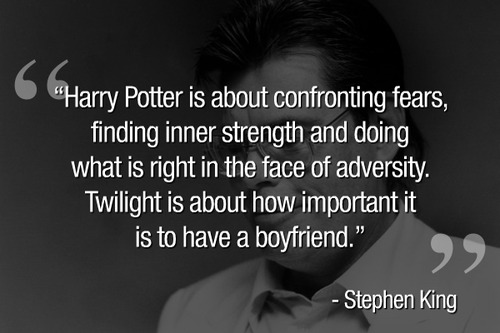 Twilight is society’s reality being put in front of us but we don’t like it because we’re too cowardly to accept that this is what we’re doing”. Don’t believe me? In HP, Harry fights villains at least seven times, if not more. That’s pretty much the only reason it’s become such a successful book, because there’s a slew of characters and we want our children to grow up with an IQ above 10. Twilight strips down the reality of our society from about the 1910s-60/70s and shows what women actually did during the time. And we choose to criticise it? Only because feminism is being drilled into our heads and anyone who doesn’t support it should be ashamed. So, what are the books actually like now? I’ll go into more detail in my comparison but that was a rant that I had for a few days bottled up. I turned 13 on April 4, woop! I know it’s been forever but tbh I haven’t had the time/effort to do this and also I have my grade 4 flute on Tuesday help I wanna die because if I don’t do my exam now then I have to learn a whole new syllabus (it expires on the 31st), and be like 2 years behind. Yay! I’m going to seperate them into categories because there’s a lot so yea! Anyways that is me embarrassing myself.